When I first learned that the Ahamanson theatre was presenting a Barry Manilow musical, I thought to myself, “Gee, cheesy 70’s musical… I grew up with the stuff… count me in!”. I thought it would be similar to Manilow’s other musical, “Copacabana“. I got Hottix for just me, and thought that was that. Then I learned what Harmony was all about — that it was a well-done story about some important history in the Jewish community. This convinced my wife that she wanted to attend (and we were lucky enough to be able to get a second Hottix, 3 weeks later, right next to me). So last night we took Metro down to DTLA, and saw the new Barry Manilow (music) / Bruce Sussman (book and lyrics) musical “Harmony“. First and foremost, set aside any preconceived notion that you may have regarding Barry Manilow’s music. This show does not sound like anything you have heard come out of Manilow’s popular music catalog. Have you done that? Good. You saw my opening reference to the musical Cabaret. That was intentional, for the musical Harmony covers roughly the same period. Harmony is a musical about the rise and times of the Comedian Harmonists, a six-member close-harmony comedy group that rose to international stardom in the early 1930s, and lasted until disbanded by Adolph Hiter and a delayed application of the Nuremberg Laws that forbade Jews from having any involvement in the arts. In short, it is the story of a popular German musical group, told against the rise of Nazi Germany. As such, it has echoes of other famous Nazi-era musicals such as Cabaret (Kander-Ebb), The Sound of Music (Rodgers-Hammerstein), and The Grand Tour (Herman)… and even The Producers (Brooks). So why this story? What makes this an important musical? The Comedian Harmonists are probably the most popular group that you never heard of. They were formed in the late 1920s by an unlikely combination: three Jews, a gentile (non-Jew) married to a Jew, and two other gentiles. The combination included a former rabbi, a former singing waiter, a former surgeon, a former opera singer, an unemployed actor, and a skilled pianist. It was a German group that included a Bulgarian, a Pole, and the son of an Italian immigrant. It reached stardom at the level of the Beatles — 13 albums, 12 movies — as Nazi Germany was coming into power, and saw that legacy destroyed by the Nazis and the group disbanded. Today, almost no one has heard of the Comedian Harmonists. Harmony is Manilow/Sussman’s attempt at telling their story. It is moving and touching, and has some extremely beautiful music. It is well acted and sung to perfection. It is a story that must be seen by any student of Jewish history, and is another warning against the totalitarian fascism that is far to ready to rise up in poor economic times. It will also fail miserably on Broadway, but is a musical that must be produced and live on. In short, it is like the Comedian Harmonists — talented and something special, with an important story to be told. Let me tackle that last point first. Musicals that deal with the Nazis (or dark themes) are difficult to turn into box office hits. Cabaret and The Sound of Music were able to do it because they only hinted at the horror that was coming. Each put the protagonists in peril, but ended the story with their escaping before the horrors happened. The Grand Tour, again, happened just as the Nazis were coming into power and left its protagonist safe. Harmony is much more on the line of musicals such as Parade or The Scottsboro Boys. These musicals end with unspeakable actions that dampen the mood, but are powerful — with that power amplified by the music — and should be seen and produced. However, they are rarely commercial successes; the audience does not walk out “happy” with their toes-tapping in a great mood. They walk out moved by the story and the underlying injustices caused by an unjust society that was overtaken and overpowered by hate and prejudice. From what I have already told you about the group, you can predict that the story does not end happy (and there is little the producers can do to make the ending a happy one, save changing history). You don’t walk out in a good mood — you walk out moved. The music in Harmony is beautiful, but in some ways lacking. Many of the songs are performance pieces in the style of the Comedian Harmonists. These propel the story less and teach about the group more. Among these is the main song, “Harmony”, that is repeated in various forms throughout the show and becomes an earworm by the end. Some are wonderful comedy pieces that truly illustrate what the Harmonists must have been like, such as “How Can I Serve You, Madame?” But none of these pieces are doing what the songs in a musical should do — moving the story along and illustrating the inner thoughts and turmoils of the characters. There are only a few songs that do that. Those songs work well, and looking over those songs, they all have one thing in common: they are not telling the story of the Harmonists as much as they are telling the story of the women in their life (I’m thinking of songs such as “This is Our Time”). One song in particular, I believe, could become a standard that would outshine this show: “Where You Go” — a loving take on the book of Ruth about women and what they give up for their men. It was a spectacular song, performed spectacularly. Harmony is directed by Tony Speciale (FB), with Christopher Bowser as associate director. Speciale and Bowser do a good job of bringing out this difficult story in a clever way, although they fail on establishing distinct characterizations for many of the members of the Harmonists. Most of them blend together, distinguished only by their voices and a few mannerisms. Still, they bring out extremely moving performances from the group, and they keep the stage busy and moving in a way that keeps the audience interest up, and belies the bad news that you know is coming. As I indicated, the performance are top notch. At the pinnacle is Shayne Kennon (FB) as “Rabbi” Josef Roman Cykowski. “Rabbi” serves as the narrator for the story (you learn why at the end) — he takes us through his memory from the founding of the group to its ultimate end, and the main relationship focus within the story is his relationship with his wife, Mary Hegal (beautifully performed by Leigh Ann Larkin (FB)) — a non-Jew who converted to Judaism to marry “Rabbi”. Kennon’s performance was just great, and his singing voice will just blow you away. He truly melted into this role and became one with it; this show is worth seeing for his performance alone. Larkin, supporting him as his wife, also gives a strong performance and just astounds in her primary numbers “This is Our Time” and, even more spectacularly, in “Where You Go”. These are two performances that will stick with you. The remainder of the Harmonists are less distinguishable. They stand out more for particular vocal characteristics (such as really deep voices) or particular comedic styles. This is more a flaw in the written characterizations than the performances, which were great. The other Harmonists were Matt Bailey (FB) (Harry Frommerman), Will Blum (FB) (Ari “Lesh” Leshnikoff), Chris Dwan (FB) (Erich Collin), Will Taylor (FB) (Erwin “Chopin” Bootz), and Douglas Williams (FB) (Bobby Biberti). Of the remaining actors, the main standout was Hannah Corneau (FB) as Roth Stern, the Bolshevik Jewess who marries a non-Jewish member of the Harmonists. Her character is a composite of a number of historical women; she stands out for the same reason Mary stands out — she’s the other half of the couple-duets in “This is Our Time” and “Where You Go”. Rounding out the performance side were Liberty Cogen (FB) (Ensemble), Greg Kamp (FB) (Ensemble, Sturmann), Chad Lindsey (FB) (Ensemble, Standartenfuhrer, Nazi Leader #1), Lindsay Moore (FB) (Ensemble), Brandon O’Dell (FB) (Ensemble, Richard Strauss, Albert Einstein, Synagogue Rabbi), Patrick O’Neill (FB) (Ensemble, Border Guard, Nazi Leader #3), Charles Osborne (FB) (Ensemble, Obsersturmfuhrer, Fritz, Nazi Leader #2), Kim Sava (FB) (Ensemble, Young Woman #1), Dave Schoonover (FB) (Ensemble, Ezra Kaplan, Cantor, Radio Announcer), Lauren Elaine Taylor (FB) (Ensemble, Marlene Dietrich, Ingrid), Kevin Brown (Swing), and Kara Haller/FB (Swing). The performance was choreographed by JoAnn M. Hunter (FB), assisted by Mary Ann Lamb (FB) (Associate Choreographer). These two did a great job of capturing the comedic movement of the Harmonists, especially in numbers such as “Your Son is Becoming a Singer”, “How Can I Serve You, Madame”, “Hungarian Rhapsody #2”, and “Come To The Fatherland”. Outside of these numbers, there is less of the traditional “dance” on sees in a musical — there are no big production numbers, no 11pm tap-marathons to blow you away. There is movement that amplifies the music. The music, I should note, was under the music direction of John O’Neill, with orchestrations by Doug Walter. O’Neill also conducted a wonderful 9-member orchestra; gone are the days of large musical orchestras. Turning to the technical side: Tobin Ost (FB)’s set for Harmony was well designed, consisting of trestles and bridges that raised an lowered, and a large digital background that served to provide context and locale. This background was aided by the projection design of Darrel Maloney (FB) — my only negative is that I don’t believe the electronic flip signs (think was used to be at Washington Dulles) were in use in the 1930s — they scream more 1960s to me. The sound design of John Shivers (FB) and David Patridge (FB) was clear and not overpowering, and made the sound seem to be coming from the performers. The lighting design of Jeff Croiter (FB) and Seth Jackson (FB) illuminated well and set the mood adequately, and provided some clever highlights at points. The costume design by Tobin Ost (FB), assisted by Leslie Malitz (FB) (Associate Costume Designer) seemed period-enough. Lora K. Powell (FB) was the Production Stage Manager, and RL Campbell/FB and Elle Aghabala (FB) were the stage managers. 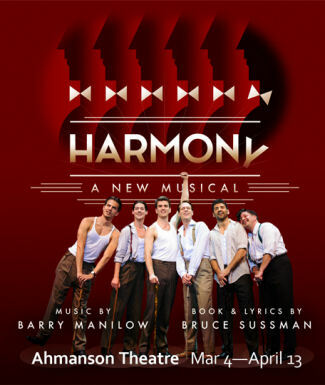 “Harmony” continues at the Ahmanson Theatre through April 13, 2014. It is well-worth seeing — especially if you are Jewish or have interest in the history of the 1930s. Be prepared to be moved, but don’t expect to walk out happy. Discount “Hottix” may still be available for select performance (as well as performance rush tickets); I’m also seeing select performances with discount tickets on Goldstar (and the discounts may be elsewhere as well). You can also experience Harmony for only $39-$49 using code MAESTRO, according to an email I received from the Ahmanson. That offer is valid in Orchestra Rows R-W (Reg $60-$70) for performances through April 11. Upcoming Theatre and Concerts: Today brings our second show of the weekend: “Author, Author: An Evening with Sholom Aleichem” at the Santa Monica Playhouse (FB). The last weekend of March is open, and will likely stay that way as we’ll be exhausted. April starts with “In The Heights” at Cabrillo Music Theatre (FB) on April 5, and should also bring “Tallest Tree” at the Mark Taper Forum on April 12. The following weekend brings a benefit at REP East (FB): “A Night at the Rock Opera“. The last weekend of April will bring Noel Paul Stookey at McCabes, as well as the Southern California Renaissance Faire. Current planning for May shows “The Lion in Winter” at The Colony Theatre (FB), and “Cat on a Hot Tin Roof” at REP East (FB), as well as “Hairspray” at Nobel Middle School. June is mostly open pending scheduling of an MRJ meeting, but I will try to fit in as much of the Hollywood Fringe Festival as I can. As always, I’m keeping my eyes open for interesting productions mentioned on sites such as Bitter-Lemons, and Musicals in LA, as well as productions I see on Goldstar, LA Stage Tix, Plays411.